Krista's fourteen year old sister was murdered by a person who followed her every move by way of posts on a social media site. Krista starts on a campaign to make teens more aware of how dangerous it is to post information that could be used by a stalker. She also tries to draw out the killer by posting her own revealing information. The situation becomes more deadly as another girl is attacked. Krista goes to the web site's CEO to enlist his help. While reluctant at first, he eventually helps her in her search. Blackstock has woven an exciting and very believable story. She depicts a realistic picture with all of the hatred and violence the situation reveals. This would be a great book for teens and college age women to read. It certainly proclaims the danger of revealing your whereabouts, whether you are alone or not, etc., on social media sites. There is violence described but perhaps that is what is needed for young women to take this issue seriously. A discussion guide at the back would make this a great book for a teen reading group. We think we make decisions based on rational thinking. We think we are in control of the decisions we make. That's what we'd like to think but that is not reality. Ariely has done a great deal of research investigating the factors that influence choice. He has looked at emotions, social norms, and a variety of other factors. 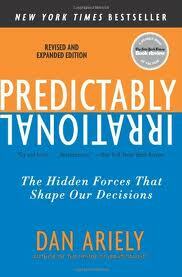 Carefully planned experiments identify many of the factors that influence choice. If you have ever wondered why you (or someone else) has made a rationally inexplicable choice, Ariely's book will be enlightening. Because I gave this book a positive review ... will that influence your decision to read the book? Will the catchy title, the colors of the cover, the book's location on the sales shelf influence your decision? Read the book and find out! I thought this might be just another of those books encouraging you to believe God for ... well, for whatever it is you want from God. But Furtick is on to something here. We U. S. Christians frequently have mundane and mediocre Christian lives. Furtick says, "... if you're not daring to believe God for the impossible, you're sleeping through some of the best parts of your life." (6) He encourages us to step out, learn to believe God for the impossible, pray with audacious faith, and act boldly. He reminds us that our confidence is not in our own ability but God's. The vision one has should never be limited by who we are or what we think we can do. "The impossible vision God wants to accomplish in your life is tailored just for you." (80) But remember, it is not about us. It's about what God can do through us! Furtick is honest. He tackles the issue when the sun sets instead of standing still, when the impossible remains impossible. Furtick won't let you get away with reading this book just for information. He wants impartation. He wants the concepts in this book to go down deep and change your life. The world is waiting. What is the impossible thing God wants to do through you? He is not Silent by R. Albert Mohler, Jr.
Mohler argues that preaching the Word of God is essential to worship. And, "...the only form of authentic Christian preaching is expository preaching." The church has a crisis today because we no longer believe that hearing and responding to the Word of God is of crucial importance. This is a book every pastor should read. If a pastor truly believes he is dealing with the very Word of God, why would he want to preach anything but that Word? That means preaching the full Word not just picking a passage here and there! It sounded so good. A female CIA operative is relocated under a new identity in a small town in Oklahoma. Danger from her past resurfaces and she tries to prevent harm to those she now loves. The book was way too romantic for me. The typical romantic plot (of boy meets girl, a problem arises, the problem is surmounted) happened over and over again. The ex-CIA operative, Page, is just too wishy-washy to be believed. The worst part was that this was audio and the reader was not good at all. A big man had a squeaky voice and anyone with a southern accent was laughable. If you love syrupy romances with a very convoluted plot, you just may enjoy this one. Otherwise, I’d skip it. Here’s how: Wright, for example, is convinced of a “spiritual” fulfillment of God’s promise to David that his throne would be eternal and there would always be one of his descendants upon it (2 Sam. 7:12-13,16). Jesus is the fulfillment of that promise, Wright says (126), although there is no physical throne we can see upon which Jesus sits. If Wright is willing to believe a “spiritual” fulfillment of that promise, then he also needs to consider a “spiritual” fulfillment of the promise to Abraham. Biblical writer Paul says that Christ is the fulfillment of the promises made to Abraham (Gal. 3:16). Paul also says that Christians are now the true descendants of Abraham and the heirs of the promises to him (Gal. 3:7,29). But then, if we consider a “spiritual” fulfillment of the promises to Abraham, perhaps it is not a physical land at all (just as it is not a physical throne of David) but the spiritual land of rest in Christ the author of Hebrews talks about in Hebrews 3:7 to 4:13. If one has read any other book on the Israeli Arab conflict there will be essentially nothing new here. If one is totally ignorant on the biblical story of Abraham through Jacob and the founding of the Jewish people, or is ignorant on the history of Islam, one can read about them both, and the origins of the current conflict, but at the whim of a biased author. Lucado wants his readers to make a difference in this world. “God has given this generation, our generation, everything we need to alter the course of human suffering.” (6) We Christians have the opportunity to make a big difference during this time of difficulty. We are encouraged to find our area of passion and act. Lucado inspires us with stories of ordinary individuals who have made a difference in the world. He takes the readers through the first chapters of Acts when a small band of believers changed the world. We are ordinary, flawed people, just like the early disciples. Like them, we can work together and be hospitable. We can stop and take time to see deeply into a person and feel compassion for those in need. We are encouraged to be prepared for persecution and face it with boldness. Lucado wants us to break down the barriers that separate us, to not write off anyone, and to pray earnestly. He concludes by reminding us that to do good to others is to do it to Jesus. I found the best part of the book to be at the end – a discussion guide with ideas for action. Using that guide within an accountability group would transform this book from “discipleship lite” to one that is life changing. T. L. Hines is known for his novels of supernatural suspense. If you are looking for demonic influence, demon possession and the rescuing from those conditions and don’t care about theological accuracy, this book is for you. There is the spiritual disease, demonic influence, which humans under the influence can spread to others. There is demonic possession that can be transferred to another human through a blood transfusion. There are the rescuers, the Falling Away, who “channel” the demonic influence (spiritual disease) out of those infected. The Falling Away are people with compulsions (to handle the evil they channel). Quinn, the Falling Away heroine who helps the diseased Dylan, has “vacant eyes,” tells lies, steals cars, etc. She is hardly a model for a Christian! If you are a Christian who knows the Bible well, this book will probably grate on your theological nerves. Two positive aspects of the book might make it appropriate to give to another with the view of discussing it. Quinn is willing to give her life to save Dylan (shades of Christ’s sacrifice) and there is a discussion of the problem of evil in the world (If God is all powerful and all good…). This would have been a great book if the author had been more consistent with truly representing the Christian viewpoint of demons and how they can be confronted.